Hashimoto’s Thyroiditis (HT) is now considered the most common autoimmune thyroiditis, the most common endocrine disorder, as well as the most common cause of hypothyroidism [1,2]. The morbidity of HT is usually high, which often concurs with other autoimmune diseases. HT is common in female patients, especially the postpartum women . Pathologically, the common denominator to all variants in HT is the marked lymphocytic infiltration of the thyroid. Thyroid follicles are destroyed and replaced by small lymphocytes so that the echogenicity of the thyroid parenchyma markedly decreases, becoming similar to that of the surrounding strap muscles. Thyroid ultrasound can also inform and quantify the volume of the thyroid gland . The field of thyroid ultrasound is expanding rapidly. When the incident waves from ultrasonic probe encounter interfaces of different organizations, the backscatter and reflection will happen, those echo signals then be collected by probe. The ultrasound machine converts the amplitude of back echo into the form of light intensity, create a two-dimensional ultrasound image on screen full of dots with different light. Each dot on the screen with their certain grey class, represents the echo information of the detected tissue or interfaces, it's gray scale level differences from dark to light depends on the intensity of acoustic echo signal of different organizations and interface. Grey-Scale Intensity (GSI) technique of ultrasound is a quantitative analyzing technique for acoustic density which could test the specific intensity of grey scale of region of interest, show as Decibel (DB), which represented the respective characteristics of different pathological tissue changes. This study investigated the clinical value of GSI diagnosis of HT. A total of 55 patients with Hashimoto’s Thyroiditis (HT group) in our hospital from January 2012 to June 2014 were enrolled retrospectively, and the male/female rate was 6/46, age was 15-76 y. Inclusion criteria: (1) Thyroid volume, the serum titers of thyroid peroxidase antibodies and thyroglobulin antibody increased significantly; (2) Confirmed with the fine needle biopsy or postoperative pathological diagnosis; (3) After above two situations were undertaken, two-dimensional ultrasound image showed an diffuse changes of thyroid, and lesions as thyroid nodules, cysts or mass were excluded. At the same time 50 healthy persons without thyroid nodules, cysts or masses, and with negative laboratory examinations, were enrolled as the control group, the male/female rate was 5/45, age was 18-73 y. Two-dimensional and color Doppler flow image were used to examine the thyroid in both groups first, and then GSI of ROI in left lobe, right lobe and isthmus of thyroid were recorded. This study was approved by the Ethics Committee of our hospital. LOGIQ E9 (Intensity technology) color Doppler ultrasonic instrument from GE company was used to examine the patients with 9 L linear array probe (5.5-10 mHz). Preconditions of gray-scale and color Doppler ultrasound were set on the thyroid test condition, and the probe frequency was set as 9 mHz, scanning depth was 4.5 cm, scanning gain was 50 DB, the time gain compensation was set as a straight line and the before/after field were maintained consistent. Patients were set at supine positions without pillow, whose under jaw was back and raised up. After the maximum cross section of thyroid shown on the transverse section, the width of thyroid was measured and the thickness of one lobe was anteroposterior diameter. Probe was moved down slightly to measure the maximum thickness of the isthmus, and maximum length of the thyroid was measured when maximum long axis was shown on longitudinal section. When the length ≥ 55 mm, width ≥ 20 mm and thickness ≥ 20 mm in one side lobe thyroid and thickness of isthmus thyroid ≥ 5 mm, meeting one criteria represented thyroid enlargement. When the length of side lobe thyroid<40 mm, thyroid was narrowed . The blood flow distribution in thyroid was detected with color Doppler flow image. After side lobe thyroid cross-section and sternocleidomastoid were clearly displayed with transverse scanning, ROI mapping on the thyroid was marked. When the mapping scope was larger than 1/2 of glandular tissue within view, GSI of ROI was obtained. In addition, after left and right lobe cross section and isthmus of thyroid were clearly displayed on the select anterior transverse section, ROI mapping on isthmus was marked, and the area should not exceed the margins on both sides of the trachea (but >1/2 of isthmus glands). The GSI in right lobe, left lobe and isthmus ROI shall be measured for five times, and the average value was calculated (Figure 1). Figure 1: GSI determination diagram. Left: thyroid maximum transverse section and sternocleidomastoid located on its anterior lateral are shown on anterior transverse section. Intensity determination sampling and mapping region in thyroid is greater than 1/2 of thyroid in the view. 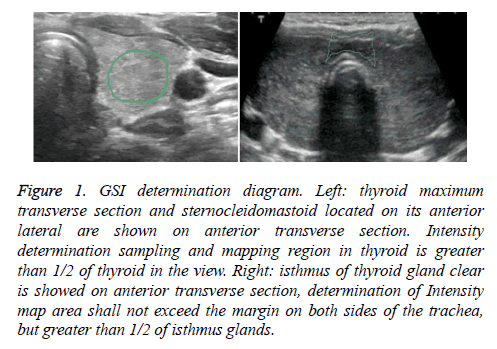 Right: isthmus of thyroid gland clear is showed on anterior transverse section, determination of Intensity map area shall not exceed the margin on both sides of the trachea, but greater than 1/2 of isthmus glands. The methods created by Sostre et al. were used for image classification: 1) G1, the thyroid gland was diffusely enlarged with the echo of the normal thyroid tissue; 2) G2, multiple scattered dots or en plaque low-echo diffused distribution on the relative normal thyroid echoes; 3) G3, thyroid enlargement with slightly lower diffuse echo; 4) G4, thyroid enlargement with significantly lower echo (Figures 2A-2D). Figure 2: A. Image of G1 thyroid. G1: the thyroid gland was diffuse enlargement with the echo of the normal thyroid tissue. B. Image of G2 thyroid. G2: multiple scattered dots or en plaque low echo diffused distribution on the relative normal thyroid echoes. C. Image of G3 thyroid. G3: thyroid enlargement with slightly lower echo intensity. D. Image of G4 thyroid. G4: thyroid enlargement with significantly lower echo intensity. According to the methods of Arslan et al. the parenchyma blood flow distribution of thyroid was staged: 1) Grade 0, normal thyroid blood flow, no obvious blood flow signal in the thyroid parenchyma, blood flow signals were observed in larger vascular branches; 2) Grade I, scattered point bars, patchy blood flow signals could be observed in the thyroid parenchyma, color Doppler mixture, the occupied area of color blood flow signals was less than 1/3 of the ipsilateral thyroid area; 3) Grade II, scattered patchy blood flow signals can be observed in the thyroid parenchyma, part color mixed with each other, the occupied area of color signals was 1/3-1/2 of the ipsilateral thyroid area; 4) Grade III, the color blood flow signals in the thyroid was rich, widely mix together, part appear colorful Mosaic shape, and color area was greater than 2/3 of the ipsilateral thyroid area. All of the above operations, including ultrasonic routine inspection, GSI determination and two-dimensional image, color Doppler flow image analysis were performed by two experienced ultrasound doctors. SPSS 17.0 was used for statistical analysis. Normal distribution data were presented as (mean ± SD), all of which were compared by independent samples t-test. Enumeration data were expressed as n (%) and compared by the Pearson’s chisquared test. Receiver operator characteristic curve was used to evaluate the GSI quantitative technology for diagnosis of HT. All tests for significance and resulting P values were twosided, with a level of significance of 0.05. In HT group, there were 9 (16.36%) cases with normal thyroid size, 42 (76.36%) cases with volume increase and 4 (7.27%) cases with volume reduction. The average length, width, thickness of thyroid and depth of thyroid isthmus were 53.23 ± 10.44 mm, 20.12 ± 4.36 mm, 19.22 ± 3.47 mm and 7.68 ± 3.15 mm, respectively. In control group, there were 39 (78%) cases with normal size, 6 (12%) cases with volume increase, 5 (10%) cases with volume reduction, the mean length, width, thickness of thyroid and isthmus thickness were 48.14 ± 8.69 mm, 17.94 ± 3.98 mm, 16.41 ± 2.88 mm, 4.47 ± 2.99 mm, respectively. There were significant differences of length, width, thickness of thyroid and isthmus thickness between HT group and control group (Table 1). Table 1. Thyroid sizes in HT and control group (mm). In HT group, there were 2 (3.63%) cases with grade G1, 13 (23.63%) cases with grade G2, 32 (58.18%) cases with grade G3 and 8 cases (14.54%) with grade G4. In control group, there were 36 (72%) cases with grade G1, 9 (18%) cases with grade G2, 5 (58.18%) cases of grade G3 and 0 cases of grade G4. The echo classification of thyroid comparison in HT group and control group are shown in Table 2, χ2=42.812, P<0.001. The comparison of each constituent ratio between above two groups had statistical significance. Thyroid low echo was the majority in HT group. Notes: comparison of thyroid echo in two groups χ2=42.812, P<0.001. Table 2. Thyroid echo grades in HT and control group (n). In HT group there were 4 (7.27%) cases with grade 0, 10 (18.18%) cases with grade I (10/55), 25 (45.45%) cases with grade II and 16 (29.09%) cases with grade III. In control group, there were 28 (56%) cases with grade 0, 16 (32%) cases with grade I, 6 (12%) cases with grade II and 0 cases with grade III. The blood flow classification comparison of thyroid of HT group with control group were shown in Table 3, χ2=46.898, P=0.000. Notes: Blood flow distribution and classification comparison in thyroid of two groups χ2=46.898, P=0.000. Table 3. Blood flow in thyroid grades in HT and control group (n). In HT group, minimum value of GSI was -40.7 DB and maximum value was -30.5 DB, in control group the minimum value of GSI was -33.1 DB and maximum was -29.1DB. In HT group, the average GSI value of right lobe was -31.95 ± 7.89 DB, left lobe was -31.89 ± 7.48 DB and isthmus was -31.99 ± 7.94 DB. In control group, the average GSI value of right lobe was -30.08 ± 6.25 DB, left lobe was -30.01 ± 6.12 DB and isthmus was -29.22 ± 6.12 DB. There were significant differences of GSI values between HT group and control group (Table 4). Table 4. GSI values in HT and control group (db). The area under curve of GSI used for diagnosis of HT was 0.870 (P<0.001). When the cut-off value of GSI was -31.55 DB, the sensitivity of GSI used for HT diagnosis was 85.5%, specificity was 72.0% and accuracy was 80.0%. HT is a multi-factor determined disease, and is one of the highest incidences of autoimmune thyropathy , the pathogenesis of HT is featured by progressive cytoclasis . In addition to immune and genetic factors, environmental factor is an important factor in HT, while excessive iodine acceptable daily intake is thought to be an environmental factor that is closely related to the incidence of HT . The prevalence of HT is about 0.8% estimated from the biochemical evidence of hypothyroidism and thyroid autoantibodies . The fibrous (or fibrosing) variant of HT is characterized by an enlarged, hard, and lobulated thyroid. The diagnosis of HT is currently established by a combination of clinical features, presence of serum antibodies against thyroid antigens (mainly to thyroperoxidase and thyroglobulin), and appearance on thyroid sonogram. Ultrasonography has become the most commonly used imaging tool in patients with thyroid diseases . Combination with color Doppler flow image or elastography could obtain additional information about the HT and improve the clinical diagnosis. Our study showed that compared with normal control group, the long, wide, thick diameter in left and right lobe of thyroid and thick diameter of isthmus in HT group were increased. Typical HT thyroid enlargement was significant, especially was characterized with isthmus thickening. Fountoulakis et al. considered that the manifestations of HT may be caused by involving of the fibrosis in the whole thyroid. This study showed that the thyroid echoes of HT group with grade G2 and G3 class as priority, compared with grade G1 and G2 as priority in control group. These results indicated that the echo intensity of thyroid in the HT group was mainly reduced. Echo intensity of thyroid at early stage of HT may be normal or scattered strip low echo in parenchyma, without funicular high echo intensity. When the HT progresses, strip platelet low echo area may be increased, expanded, or even fused together . The different grades of lymphocyte infiltration and lymph follicle formation in thyroid tissues could constitute the focal or diffuse low echo of thyroid pathological basis in HT patients . In advanced stage of HT, because of thyroid follicular atrophy and extensive fibrosis of tissues, this disease presented the trend of ‘‘hypothyroidism’’. This is the pathogeny that grid high echo appeared in the thyroid parenchyma, which represented funicular high echo with grid distribution within low echo by ultrasonic examination . The HT twodimensional ultrasound examination of thyroid enlargement is significantly caused by these factors, with isthmus thickening, and diffuse echo reduction in parenchyma, with scattered, grid distributed funicular high echo, all of those image characteristics above together makes a “fresh fish slice” sign (Figures 2C and 2D). The expression of blood flow distribution of HT was different due to different grades of disease progression. Our study showed that, in HT group, the blood flow classification was given priority to grades II and III; in the control group, the blood flow was given priority to grades 0 and I. Our results were highly consistent with the many other studies. Scholars found that the formation of blood vessels in the thyroid of patients with HT was due to the free T3 and T4 decrease and increase of thyroid stimulating hormone, which stimulated the thyroid follicular epithelial cells and produced vascular endothelial growth factor. Vascular endothelial growth factor receptors on the surface of endothelial cell were activated that lead to endothelial cell regeneration and the blood vessels formation. Vessels among thyroid follicles were increased significantly and lumen expanding. Therefore, there were increased thyroid blood flow signals on the color Doppler flow image mode at the early stage of HT. On the other hand, because the thyroid follicular was destructed widely and most of the thyroid was replaced by fibrous tissues, the ability of thyroid hyperplasia was declined at the advanced stage of HT. There were reduced thyroid blood flow signals on the color Doppler flow image mode at the advanced stage of HT . Two-dimensional ultrasound imaging is the technology using the probe to convert electrical signals into acoustic signals. Different tissues can produce different scattering signals to the incident acoustic wave, as different gray-scale light spots expressed on the screen. Doctors can identify different diseases according to the gray-scale grades of visceral organ, but the accuracy of diagnosis is limited by the experience and skill of operators. Intensity technologies used in this study could obtain the GSI based on grey-scale of different tissue examined by ultrasound, which represented as specific DB value. In HT patients whose progression and degrees of lymphocyte infiltration or fibrosis are different, there are differences of echo intensity (represented as DB values) in thyroid parenchyma. GSI value was positively correlated with the echo intensity of thyroid tissue significant. The lower the thyroid echo was, the smaller the GSI negative value was which means the greater the absolute value of GSI was. It is suggested from receiver operator characteristic curve analysis results that there was high accuracy of GSI for the diagnosis of HT. The application and research of GSI quantitative technology were still at early stage . Sun et al. used Backscatter integration (Integrated Backscatter) technology for HT patient researches on the change of thyroid function, Integrated Backscatter measured value can reflect the histopathological changes of thyroid. Integrated Backscatter changes reflected the thyroid function changes in HT patients . This technology required a sampling frame placed in ROI to obtain GSI, and the frame could be obtained by doctors using the trackball for ROI mapping. In the process of this study, we found that there were different GSI values according to different sizes of mapping sampling frame. The cervical region transverse section was used to examine in this study. After the maximum cross-section of side lobe thyroid and ipsilateral sternocleidomastoid were clearly showed, sampling frame of thyroid could be identified, with the scope was larger than 1/2 of gland tissues in the view. After the left and right lobes of thyroid and isthmus thyroid were clearly showed at the anterior cross-section, intensity ROI mapping of isthmus was carried on, and mapping region shall not be exceeded the margin on both sides of the trachea, but greater than 1/2 of isthmus gland. GSI was obtained when each of above action was carried on for five times, and average value was calculated. The method of multiple mappings averaging can greatly reduce the interference of human factors. In addition, present conditions of machine were also very important. This study selected fixed probe frequency, scanning condition, scan depth, gain value, etc., therefore the interference of machine factors to this study was reduced as far as possible. In summary, this paper only discussed the application of GSI quantitative analysis technology for the diagnosis of HT. In practical work, some HT patients are characterized by focal or nodular lesions, and co-existed with other lesions, and such cases are not included in this study, whom can be studied in the future. This work was supported by clinical medicine scientific and technological innovation projects of Jinan Science and Technology Bureau in 2015. McLeod DS, Cooper DS. The incidence and prevalence of thyroid autoimmunity. Endocrine 2012; 42: 252-265. Khanolkar A, Williams MA, Harty JT. Antigen experience shapes phenotype and function of memory Th1 cells. PLoS One 2013; 8: 65234. Ahmed R, Al-Shaikh S, Akhtar M. Hashimoto thyroiditis: a century later. Adv Anat Pathol 2012; 19: 181-186. Koprowski R, Zieleznik W, Wrobel Z, Małyszek J, Stepien B. Assessment of significance of features acquired from thyroid ultrasonograms in Hashimotos disease. Biomed Eng Online 2012; 11: 48. Caturegli P, De Remigis A, Rose NR. Hashimoto thyroiditis: clinical and diagnostic criteria. Autoimmun Rev 2014; 13: 391-397. Sostre S, Reyes MM. Sonographic diagnosis and grading of Hashimotos thyroiditis. J Endocrinol Invest 1991; 14: 115-121. Arslan H, Unal O, Algn E, Harman M, Sakarya ME. Power Doppler sonography in the diagnosis of Graves disease. Eur J Ultrasound 2000; 11: 117-122. Burek CL, Rose NR. Autoimmune thyroiditis and ROS. Autoimmun Rev 2008; 7: 530-537. Dong YH, Fu DG. Autoimmune thyroid disease: mechanism, genetics and current knowledge. Eur Rev Med Pharmacol Sci 2014; 18: 3611-3618. Teng W, Shan Z, Teng X, Guan H, Li Y, Teng D, Jin Y, Yu X, Fan C, Chong W, Yang F, Dai H, Yu Y, Li J, Chen Y, Zhao D, Shi X, Hu F, Mao J, Gu X, Yang R, Tong Y, Wang W, Gao T, Li C. Effect of iodine intake on thyroid diseases in China. N Engl J Med 2006; 354: 2783-2793. Beggs AD, Thomas PR. Point of use ultrasound by general surgeons: review of the literature and suggestions for future practice. Int J Surg 2013; 11: 12-17. Fountoulakis S, Vartholomatos G, Kolaitis N, Frillingos S, Philippou G, Tsatsoulis A. Differential expression of Fas system apoptotic molecules in peripheral lymphocytes from patients with Graves disease and Hashimotos thyroiditis. Eur J Endocrinol 2008; 158: 853-859. Ramanathan S, Mohammad SS, Brilot F, Dale RC. Autoimmune encephalitis: recent updates and emerging challenges. J Clin Neurosci 2014; 21: 722-730. Li Y, Zhou G, Ozaki T, Nishihara E, Matsuzuka F, Bai Y, Liu Z, Taniguchi E, Miyauchi A, Kakudo K. Distinct histopathological features of Hashimotos thyroiditis with respect to IgG4-related disease. Mod Pathol 2012; 25: 1086-1097. Caturegli P, De Remigis A, Chuang K, Dembele M, Iwama A, Iwama S. Hashimotos thyroiditis: celebrating the centennial through the lens of the Johns Hopkins hospital surgical pathology records. Thyroid 2013; 23: 142-150. Ishay A, Pollak Y, Chervinsky L, Lavi I, Luboshitzky R. Color-flow Doppler sonography in patients with subclinical thyroid dysfunction. Endocr Pract 2010; 16: 376-381. Guo Y, Liu Z, Yu P, Liu C, Ming J, Zhang N, Yusufu M, Chen C, Huang T. Using foci number to predict central lymph node metastases of papillary thyroid microcarcinomas with multifocality. Int J Clin Exp Med 2015; 8: 9925-9930. Sun H, Xia D, Zhang W. The value of high frenquency ultrasound and backscatter integration for thyriod function study. Chin J Ultrasound Med 2010; 26: 18-21.